Age of Empires II is part of a winning-award video game franchise which has been enjoying tremendous success from the late 1990s onwards among real time strategy gamers from all of the corners of the world. Age of Empires II, often abbreviated to AoK or AoE II, focuses on the Middle Ages, highlighting the most important turning points in medieval history. From the Holy Land to the northern frozen fields of the Scandinavian peninsula, Age of Empires II: The Age of Kings comprises 5 historical campaigns: William Wallace (set in Scotland), Joan of Arc (set in France), Saladin (set in the Middle East), Genghis Khan (set in Mongolia and in Eastern Asia) and Fredrick Barbarossa (set in Central Europe). Modding a strategy game can be quite difficult as it requires time, significant resources (i.e. proper system requirements, a set of basic modding programs, design skills, etc.) as well as knowledge in regards to history in the case of the Age of Empires franchise (which is mostly used for the scenario information included in a custom campaign but it can also be beneficial if you consider adding a couple of other historical files into the History section of the game as well). In order to mod a certain video game like Age of Empires II you need to have a program or a set of programs/applications which give(s) you the possibility of editing the game’s graphics (including the textures for units and buildings) as well as to create code lines and modify the previous settings of the whole game. For Age of Empires II: The Age of Kings and its expansion pack The Conquerors, you must firstly have the ModPack Studio, which is by far the best modding tool for the two games released to date. You also need DRS AoK which was created by user Ykkrosh. DRS AoK is a program that helps you quickly view and extract game data from the main directories of the game. ModWorkshop is another important utility that allows you to change graphics, data and several other minor details. It was last time updated in 2008 (to version 1.4) and was created by user Jatayu. Finding other useful tools or additional tips concerning modding this game are easy to be found if you stay in touch with the Age of Empires II Heaven website. The information on the respective website is highly valuable for creating mods and it also includes helpful guidelines and tutorials on how to create a mod pack. One of the greatest mods for Age of Empires II created thus far is Age of Chivalry: Hegemony, which was made by Kor Bosch and Andrew Dunn. To date, it has been downloaded for more than 20,000 times. Age of Chivalry: Hegemony was released on the Age of Kings Heaven Site and was created by Kor Bosch and Andrew Dunn. The mod pack replaces 18 existent civilisations with new ones, namely: Austria, Bavaria, Bohemia, England, Wales, Scotland, Denmark, Guelders, Friesland, Flanders, France, Brittany, Helvetia, Poland, Savoy, Burgundy, Saxony and Genoa with their own technologies, architectures and unique units. 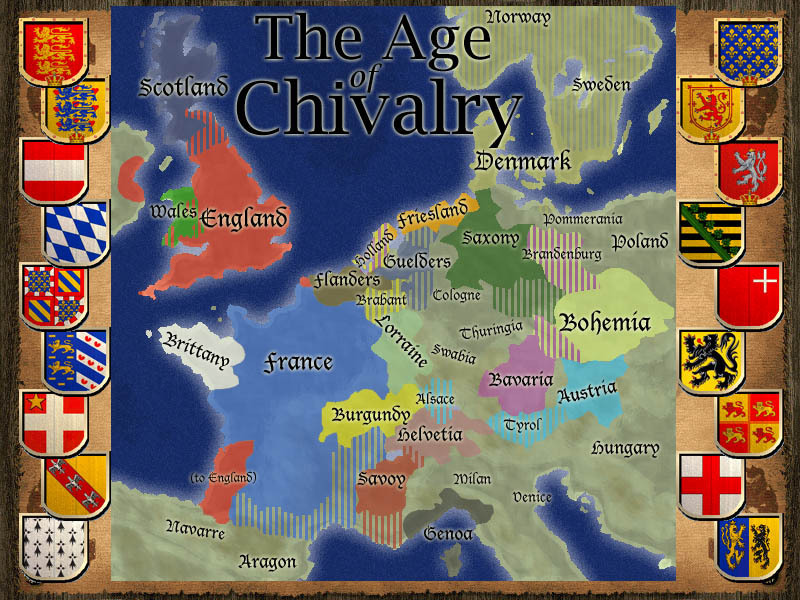 The map of Western and Central Europe during the Age of Chivalry: Hegemony’s timeline. This mod pack focuses on a certain timeline of the Middle Ages and resets the game’s main historical period between 1100-1500 AD, giving the player total control on the most powerful European kingdoms of the time. The licence type for this program is freeware, given the fact that is a fan made add-on package.